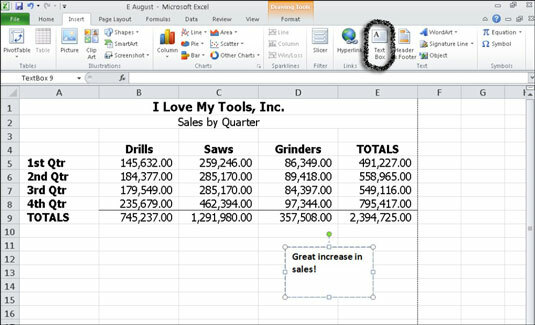 Text boxes in Excel 2010 are graphical boxes that you can use to add explanatory text or commentary to a worksheet or chart. Text boxes can be positioned wherever you like and can be formatted to match the chart or worksheet data that they accompany. On the Insert tab, click the Text Box button in the Text group. The mouse pointer looks like an upside-down cross. Click and drag diagonally on the worksheet (or in a chart) to draw the box the size you want. A blinking cursor appears inside the text box. The text wraps when you reach the right side of the box. Press Enter as you type if you want to begin a new line. 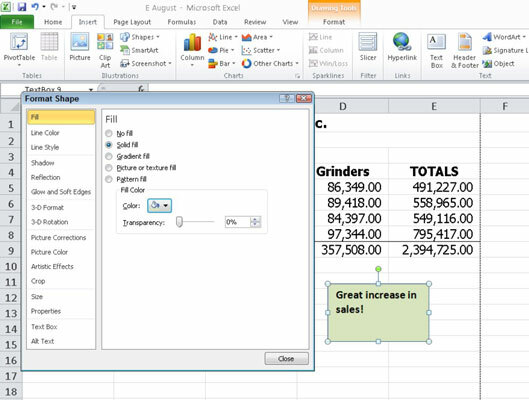 Use a text box in Excel 2010 to annotate data in a chart or worksheet. Click outside the text box to deselect it. The selection handles disappear and the text box contains the typed text. If you just need to edit the text inside a text box, click inside the text box and change the text as needed. Use the commands in the Font group on the Home tab to edit the font properties. Drag any selection handle to resize the text box. Drag the text box border (between the selection handles) to move the text box. Click the text box border and press the Delete key to delete the text box. To add a background fill to the text box, click Fill in the left pane and select an option from the right side of the dialog box. To change the border color that surrounds the text box, click Line Color and choose a line color option. To change the style of the line surrounding the text box, click Line Style and choose any desired options. To add a shadow around the text box, click Shadow and then choose an option from the Presets drop-down list. Make the text box three-dimensional with choices on the 3-D Format and 3-D Rotation tabs. From the Text Box tab, select Resize Shape to Fit Text. As you add or remove text from the text box, the box expands or contracts to fit around the text. Click Close when you’re done. The text box displays the applied formatting. Format a text box to add emphasis.